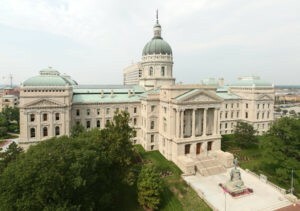 Legislators returned to the Statehouse one week ago for the “short” session of the Indiana General Assembly. That means adjournment must occur no later than March 14 and there is no budget to construct as the current two-year plan was put into place in 2017. Technology and innovation issues, however, will be on the table. This follows some early successes in 2017 (see Page 5 of the comprehensive 2017 Final Legislative Report) that included establishment of the Next Level Fund, resources for the Management and Performance Hub, enhanced broadband connectivity and more. The Indiana Technology and Innovation Council Policy Committee, led by John McDonald of ClearObject and Bill Soards of AT&T Indiana, worked through the remainder of 2017 to craft new and revised policy positions moving forward. They were the focus of much of the discussion at the second Tech Policy Summit in early December and in meetings with legislative and executive branch leaders. We enter the new session cautiously optimistic of continued progress. Among the key topics: clarity of tax treatment of software-as-a-service (SaaS), computer science education requirements for students and development of an autonomous vehicles policy. Additionally, TechPoint is accepting applications for the 19th annual Mira Awards honoring ‘the best of tech in Indiana.’ The Mira Awards are like Indiana’s Oscars for technology with award categories recognizing the people, products and companies that make our community so special. Applications are due January 19. Visit https://techpoint.org/mira/ to apply. This year’s black-tie gala celebration will be held Saturday, April 28, at the JW Marriott – Indianapolis. You can learn more about this year’s upcoming Mira Awards from the official awards program launch press release. Indiana's strong business climate and favorable cost of living is making the Hoosier state a popular place for startup businesses. As this blog and BizVoice feature about DeveloperTown convey, Silicon Valley doesn't have much on the budding ideas and energy emanating from the heartland — especially in Central Indiana. Tuesday, five Indiana entrepreneurs are meeting with White House staff in Washington, D.C. about how to make Indiana's startup climate even better. Below is an excerpt from a press release, as well as background on Indiana's representatives as written by Kevin Hitchen of Localstake. Startup leaders from across the country will convene in Washington, D.C. on February 5th to meet with administration officials to discuss the importance of fostering vibrant startup communities throughout the U.S. These Startup America Region Champions will also unveil their regions’ plans to push their startup ecosystems to the next level. Representatives from the Small Business Administration, Office of Science and Technology Policy and the Department of Commerce will take part in the meeting. Participating regions include: Startup Arizona, Startup Colorado, Startup DC, Startup Indiana, Startup Iowa, Startup Maryland, Startup North Carolina, Startup Nebraska, Startup Tennessee, Startup Texas and Startup Virginia. This meeting will be preceded by the Kauffman Foundation’s State of Entrepreneurship luncheon and followed by a reception hosted by Startup DC at the brand new D.C. startup hub 1776. Michael Coffey, who raised $2.5 in 60 days in 2010 and started a niche marketing company, moved from Napa Valley to Indianapolis because he is so impressed with Indiana's startup scene. In 2012, he became partner at DeveloperTown. Kevin Hitchen is one of the founders of Localstake, a new investment marketplace that allows individuals to invest in local private businesses. Localstake recently registered as a broker-dealer with the SEC and FINRA, so it can offer private business investing before the JOBS Act is implemented. Matt Hunckler is the founder of Verge, a 2,000-member platform for software entrepreneurs in the Midwest. He leads startup efforts at Social Reactor, a premium social engagement platform based in Carmel. Michael Langellier is the new CEO of TechPoint, Indiana’s technology growth initiative. He cofounded MyJibe, which he sold to MoneyDesktop in November 2011. Dustin Sapp is president and co-founder of TinderBox, the third company he has helped start in Indianapolis. He has been recognized locally and regionally for efforts in entrepreneurship. TechPoint, the Central Indiana Corporate Partnership’s technology and entrepreneurship initiative, is now accepting nominations for its 2010 Mira Awards. The annual Mira Awards put a well-deserved spotlight on the state’s most successful technology-driven companies, in industries like information technology, advanced manufacturing, the life sciences, and logistics. Mira Awards are also presented in categories like health care technology, new media innovation and corporate IT (recognizing the achievements of the internal technology departments of our leading companies). Mira is the largest and most prominent awards program of its kind in Indiana; finalists and winners receive significant publicity and valuable exposure to the high-tech and business communities at large. Visit http://techpoint.org/Mira/ for more information – nominations are due March 8.